Here is a list of links of all the websites that I've created so far. A website on this LA band from Germany! A website on the ex bass player of Guns and Roses! A site on the actress of ("The Facts of Life" & "The Division") Nancy McKeon! A website on the actress of (Party of 5, The Scream Trilogy, Wild Things, The Craft and more) Neve Campbell! 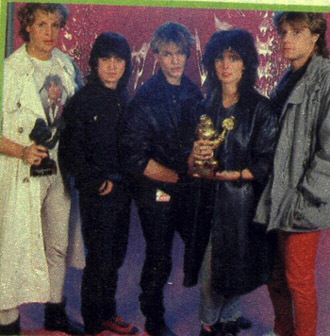 An unofficial site on this super great German 80's rock-pop band, Nena. A website on the bass player of the 80's German Rock-Pop band, Nena! An official website on the drummer of the 80's German Rock-Pop band, Nena! A site on the guitarrist of the LA 80's glam-rock band, Faster Pussycat, Greg Steele. A website on my neighbor's business! A site on the professional DJ's, Rob and Sidney! A picture page on the Seattle band, Alien Crime Syndicate! My business site.Do you need a site for your band or your business? This Faster Pussycat site is the Italian version of the official site! Here is a list of all the Yahoo Clubs that I've made. This is a Yahoo Club for the fans of the 80's band Nena! Nena was really famous in Europe, unluckely not that much here in the States. A Yahoo club for the fans of Nancy. Check it out! A Yahoo club for the fans of Duff, ex-GNR! This is the Yahoo club about the new Seattle band of Duff McKagan, ex-GNR!